Louth Old Boys were dumped out of the Cusworth Cup after a strong second half display from quarter-final opponents Holton Le Clay. Reece Southwood’s strike helped Louth go in level at 1-1 at half-time, but three second-half goals carried Holton through to a semi-final with Cleethorpes Town A.
Alford Town host Tetney Rovers in the first leg of the other semi-final on Saturday in what will be their first match on more than a month. 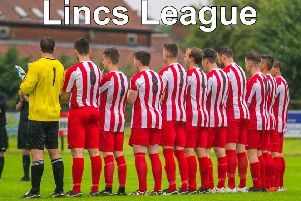 Louth Old Boys Reds maintained their 100 per cent record in the Tim Sales Trophy group stages with two wins in four days. On Tuesday they thrashed Alford Town Reserves 7-1, with Jordan Tebbs (2), Lance Johnson (2), Terry Ramsden, Joshua Watson-Lingard and James harness all on target. And on Saturday they edged to a 3-2 win at Marsh Rovers, with Tebbs again on the scoresheet alongside Sam Eggleston and Alfred Vickers. In Group B, Louth Old Boys Vets slumped to their fourth straight defeat, losing 3-0 at home to leaders GB Kitchens.